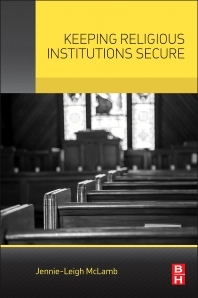 Keeping Religious Institutions Secure explores the unique vulnerabilities that churches, synagogues, and mosques face in regards to security, making them attractive to criminals who see them as easy targets. The text illustrates why all places of worship should think about security and the types of breaches that can drive people away. The book focuses on the most frequent security concerns experienced by houses of worship, including embezzlement, vandalism, assault, hate crime, and in rare cases, an active shooter—and how to help prevent them from occurring. Beginning with an overview of the basic security concepts and principles that can enhance the security of any religious facility, it then delves deeply into the particular security concerns of houses of worship, including the use of volunteers, protecting religious leaders, ensuring safety for children and teens, interacting with local law enforcement, handling the media, and much more. Covers security best practices that are adaptable to any type of religious institution. Addresses the key security measures—physical, electronic, environmental, and procedural—for protecting people and facilities. Includes guidance on identifying threats and vulnerabilities and instituting countermeasures for deterring crime and violence. Security practitioners and consultants, law enforcement, and clergy and lay leaders in houses of worship. Jennie-Leigh McLamb, CPP, PSP, PCI, has over 10 years of experience in private security. Currently, she is an independent security consultant who advises businesses and other institutions on preparedness and planning for a variety of threats, as well as conducts risk assessments and physical security surveys. She also conducts training sessions and designs curricula for a variety of topics including workplace violence prevention, security awareness, creating policies and procedures, screening social media for new hires, and situational awareness. She began her security career in the Private Security Services Section of Virginia’s Department of Criminal Justice Services (DCJS) where she performed a variety of functions including evaluating sources for alternative training credit, conducting compliance agent training, and helping develop new regulations as well as internal policies and procedures for regulating private security personnel. As the compliance and training administrator for a private security company, she managed training and licensing of over 1500 individuals across multiple jurisdictions and contract requirements, designed and updated curriculum and tests, and developed training plans in support of business proposals. She is an instructor and curriculum developer for both online and onsite courses in various security topics including access control, patrol, confrontation management, and others. In addition to her ASIS certifications, she has an MS in Security Management and is finishing an MBA with concentrations in Cybersecurity and Information Security Management.